A geo cache which a friend of mine tried to spot recently (see here, in German) required to do some MD5 hash calculation. If you want to have an MD5 hash for a whole file, you probably don't want to read this file entirely into a string. In that case you can use MessageDigest's methods update(byte input) and digest() to calculate the hash chunk-wise, as you are reading the file into a buffer. A complete code example can be found here. If you do not necessarily have to work with MD5 hashes, Apache Commons IO might be an alternative as well. Its class FileUtils offers – besides a lot of other very convenient functions, in especially for copying files and directories – the method checksumCRC32(File file), which calculates a file checksum using the CRC32 routine. While trying to build a Maven based project using JAX-WS RI 2.1.5, I noticed, that Maven tried to download the artifact wstx-asl-3.2.3.pom upon each build. Unfortunately without much success, but resulting in an increased build time. As it turned out, the dependency to the Woodstox XML processor in JAX-WS RI's pom.xml is apparently wrong. There is also an item at JAX-WS RI's issue tracker commenting on that problem. Having pimped your pom.xml as described above, Maven should stop wasting your time by trying to resolve the flawed dependency over and over again. For a recent project, a colleague of mine and I created a Maven archetype, allowing for a very simple creation of web service projects (more to follow in a future post). Everything worked out fine on our boxes, but another colleague we asked for testing the archetype, reported, that he had some trouble using it. For me, it helped to remove the archetype plugin from my local Maven repository by deleting the folder /home/<username>/.m2/repository/org/apache/maven/plugins/maven-archetype-plugin before issuing the command above. This forces Maven to download the archetype plugin again, for some reason causing it to find the archetype catalog properly. If I try to create another project from using the catalog – having the archetype plugin in my local repo now – the same error as before occurs. Redmine is a project management software written in Ruby. It offers a lot of interesting features such as an issue tracker, wiki functionality and news feeds. This post will show up the steps required to install Redmine and run in it on JRuby using Glassfish application server. All required dependent gems (such as activerecord-jdbc-adapter) will automatically be downloaded by RubyGems. Next, the database to be used by Redmine needs to be set up. We will be using MySQL, as it is a very common companion for RoR apps, though other database servers should do the trick as well. Repeat the latter two steps for schemas redmine_test and redmine_development and leave the MySQL shell. This will cause the named directories to be packaged into the resulting WAR. Find the line beginning with "#config.gems += " and uncomment it, allowing for the gems active-record-jdbcmysql-adapter and jruby-openssl to be packaged into the WAR as well. 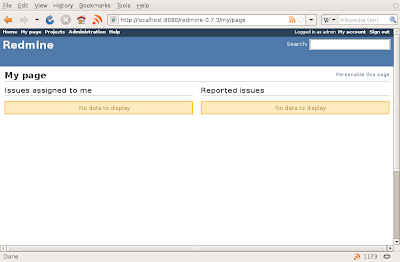 Upon success, Redmine can be accessed at http://localhost:8080/redmine-0.7.3. Click "Sign in" in the upper right, log in using "admin"/"admin" as user/password and you should see your personal Redmine page as depicted below. Typically, you would now create a project or other user accounts, which can be done under "Administration". Welcome to this blog. I am a Java EE developer, and will report here on my latest insights from time to time.